Enjoy tapas at Rojo at The Bazaar by José Andrés on Valentine's Day 2010. Tapas:Seven kinds of tapas. On Valentine's Day. Perfect for sharing, on the day we should all be sharing something. 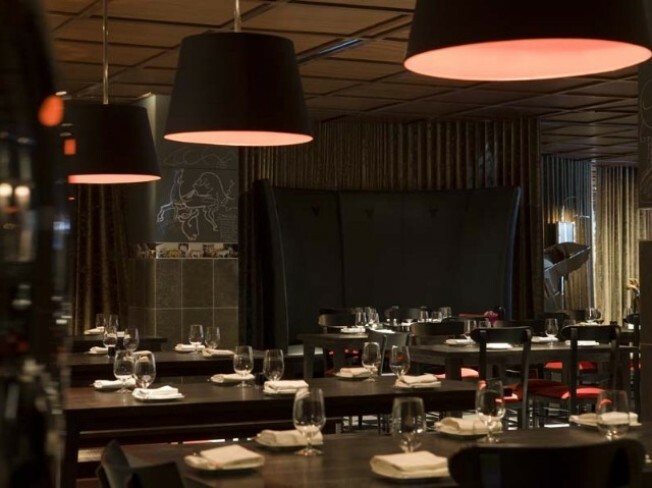 Location: Rojo y Blanca, part of The Bazaar by José Andrés at SLS. The menu: Over a half dozen tapas. Expect to see dishes like Not Your Everyday Caprese Salad, Tuna Ceviche, Foie Gras Cotton Candy, Liquid Olives, Boneless Chicken Wings. The menu will be fluid, we expect, fluid like liquid olives, so relax and enjoy whatever seven savory surprises show up on your plate. Liquid Olives: This is the dish that people come home and post about, recommend, wake their friends to discuss, puzzle about and/or marvel over. If you haven't had Chef Andrés unusual take on small orb we know so well, this is something that should be kept a surprise. Menu price: $95 per person. Saving room: We would, since you'll be right by the Patisserie at SLS. Earl Grey bon bons, Raspberry Dust lollipops, and Lime Fizzy Rocks. Valentine's candy gone stylishly sci-fi.